Starting with one classic sailing boat, Burma Boating was founded in 2013 by three passionate sailors -- Herbert Mayrhauser, Christoph Schwanitz and Janis Vougioukas -- who discovered the Mergui Archipelago, 800 islands in southern Myanmar, during a sailing trip. They founded the company to take other travellers the Mergui, which is only just starting to open up to tourism and currently has no hotels. 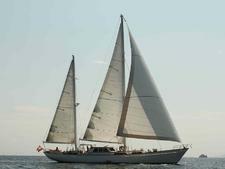 Launched with the classic sailing yacht Meta IV, the fleet comprises eight yachts and the expedition vessel Drenec. It is the only yacht charter company operating a base in the area, and offers cruises and yacht charters for individual guests and groups of up to 12 passengers. 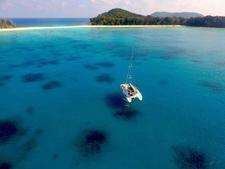 Cruises are also offered to India's Andaman Islands, from Thailand. Burma Boating runs the Sailing Clinic, a charity project bringing medical care to its sailing area. Once or twice a year, the company invites doctors to join cruises and visit villages without any medical facilities in the Mergui Archipelago. Burma Boating offers cruises to two of the most unexplored regions of the world -- Myanmar's Mergui Archipelago and India's Andaman Islands -- on its fleet of ten classic sailing vessels. The onboard atmosphere is relaxed and laid back; for example, shoes aren't needed. All the vessels are fully crewed with a captain, deck hands, chef, stewards and, sometimes, also a dive master and onboard massage therapist. The crew do all the sailing, but any passengers with a sailing background are welcome to help with navigating, setting sails and steering the boat (and of course, you don't have to). Crew members are also happy to teach the basics to non-sailors. Burma Cruising offers a mostly inclusive experience, with all onboard meals, water, soft drinks and airport transfers included. The chef on each boat cooks three daily multi-course meals, mainly Thai cuisine. All cabins have power outlets, air-conditioning, fans and an en-suite bathroom, with shower, sink and toilet. Towels are provided. There is fresh water for showering and in the kitchen. The company has a strong environmental policy and offsets its carbon emissions, uses biodegradable cleaning products and tries to avoid the use of plastic water bottles to reduce rubbish. The majority of passengers are from the United States, U.K. Australia, Switzerland and Germany; many of them ex-pats living in Asia. They are well-traveled with a sense of adventure, and include stressed-out businessman and busy people seeking an escape from the rat race. The company specializes in flexible itineraries that feature remote, hard-to-reach destinations. The main itineraries are five and seven-night sailings in the Mergui Archipelago and Marine National Park and 10 and 12-night voyages in the Andaman Islands. Yachts, which are all fully crewed, can also be privately chartered for longer periods. The most luxurious vessel in the fleet is the 13-foot Clan VI, which was built in Italy in 1983 and refitted in 2014. It accommodates 10 passengers in five cabins and has a crew of six or seven. Meltemi, a 51-foot catamaran, was launched in 2011 and carries eight guests in four cabins and a crew of three or four. Previously owned by a Malay princess, the vessel was bought by Burma Boating in 2015. Ideal for small groups and families, Scame, built in 1971, is a 72-foot vessel with room for up to six passengers in three cabins and three or four crew. The 77-foot Jubilaeum, completely refitted in 2014, also accommodates six passengers in three cabins and is sailed by a crew of four. The 79-foot schooner Dallinghoo, accommodating eight passengers in four cabins and a crew of five, was built in 1990 and underwent a two-year keel-up rebuild from 2014 to 2016. Meta IV also has room for eight passengers in four cabins and a crew of four. The 85-foot vessel was launched in 1998 and refurbished in 2012. The 95-foot Aventure was built in 2011 and carries six passengers in three cabins and a crew of five or six. 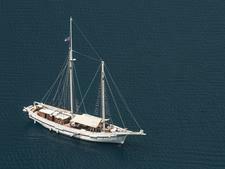 Built in 2006, Raja Laut is a 100-foot schooner that accommodates 12 passengers in six cabins and has a crew of six or seven. The line's other schooner is the 100-foot Sunshine, launched in 2003 and built according to historic designs drawn up in 1900. The vessel has room for eight passengers in four cabins, and has a crew of five. The 120-foot exploration vessel Drenec was originally built as a working vessel in the Netherlands and refitted and upgraded in 2012. Accommodating up to 11 passengers in six cabins, and five to seven crew, Drenec joined Burma Boating in 2015.